The average school-leaver expects to earn an annual salary of almost £90,000 at the height of their career – despite the UK average being £26,500, according to new Santander research. The bank, which is one of the UK’s biggest personal financial service providers, spoke with almost 500 Year 11 students to gain an insight into their career attitudes to discover they think they’ll be taking home £89,000. 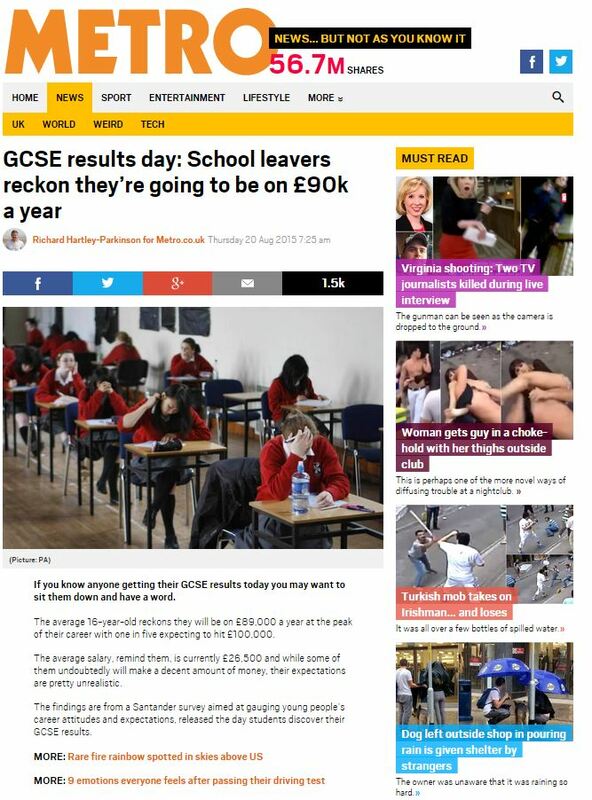 If you know anyone getting their GCSE results today you may want to sit them down and have a word. The average 16-year-old reckons they will be on £89,000 a year at the peak of their career with one in five expecting to hit £100,000. 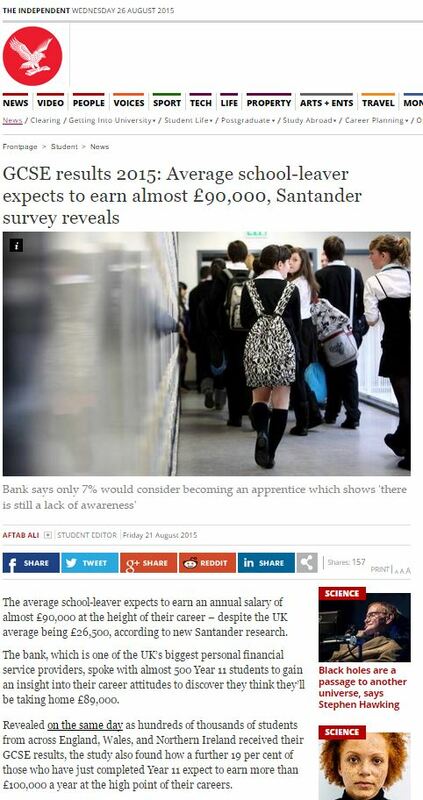 The average salary, remind them, is currently £26,500 and while some of them undoubtedly will make a decent amount of money, their expectations are pretty unrealistic. The findings are from a Santander survey aimed at gauging young people’s career attitudes and expectations, released the day students discover their GCSE results. 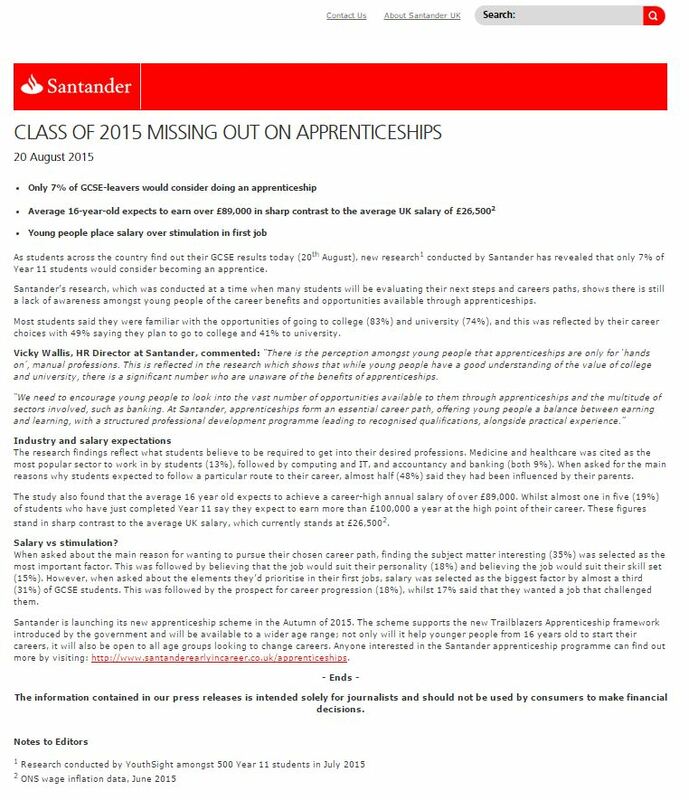 The results also showed how apprenticeships are being perceived among the group: only seven per cent would consider becoming an apprentice which, Santander said, shows there is still a lack of awareness amongst young people of the career benefits and opportunities available through becoming one. HR director at Santander, Vicky Wallis, described how there is the perception amongst young people that apprenticeships are only for ‘hands on’, manual professions. While young people have a good understanding of the value of college and university, she said, there is a significant number who are unaware of the benefits of apprenticeships. As for the kids and their sky-high salary expectations, while what they want to earn might not be too closely aligned to reality, to have this pointed out by workers in the banking industry is something of a pot and kettle scenario. This entry was posted in Santander and tagged Aftab Ali, independent, metro, Richard Hartley-Parkinson, Santander, Vicky Wallis, YouthSight on August 31, 2015 by Michael Marshall.